• You may remember these guys from their amazing fall engagement session last year. It’s still one of my all time favorites. • You know it’s going to be a good day when it starts off with the bride’s sister getting everyone to smile for a posed picture by saying “think of Corey naked!” I about fell over but they quickly told me about the inside joke and I started laughing. I guess a few years ago in order to get the family to smile, a past professional photographer said to think of her naked to get laughs. LOL! • These two were so fun to play with, seriously. Such great sports with easy going personalities. Made my job a breeze! • It’s hard for me to pick favorites among all of the many beautiful wedding gowns I see but I have to say, Amanda’s definitely ranks as one of my all-time favorite dresses ever. SO amazing! • Special thanks to Nicole for coming along! 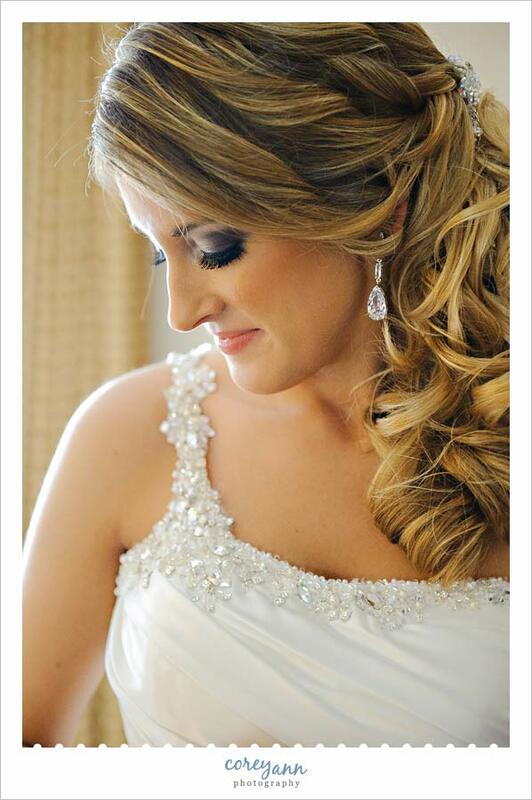 Amanda spent the morning getting ready at her hotel suite at the Radisson in Olmsted. 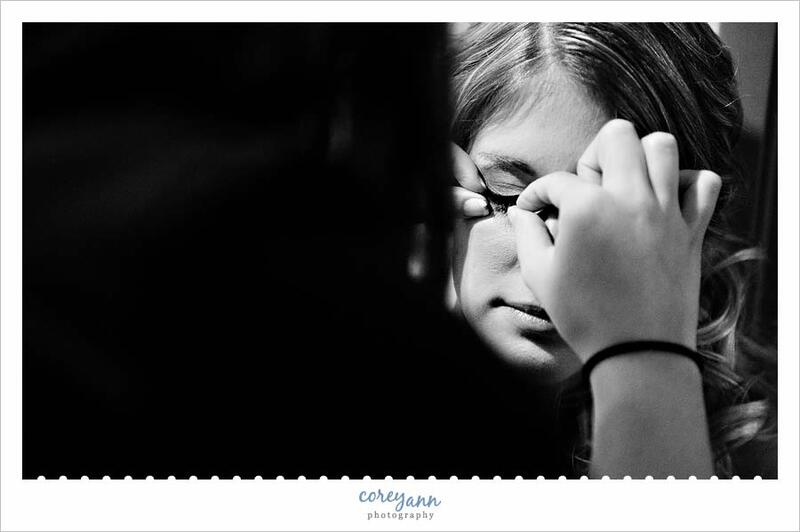 I always love when I am able to capture the makeup getting done! While I was photographing Amanda’s final prep, Nicole went down and hung out with Matt and his groomsmen. While they were zipping up Amanda’s dress I captured this image of her waiting patiently. So beautiful! They had to pin the veil in once they had it placed just right and I loved the look of it over her face. I’ve done this once in the past and I have to say I absolutely LOVE having a bridesmaid first look. As with Carrie, Amanda got ready with her Mom and sister and then came out once everything was perfect for the rest of her bridesmaids to see. As you can tell, they were overwhelmed with emotion. 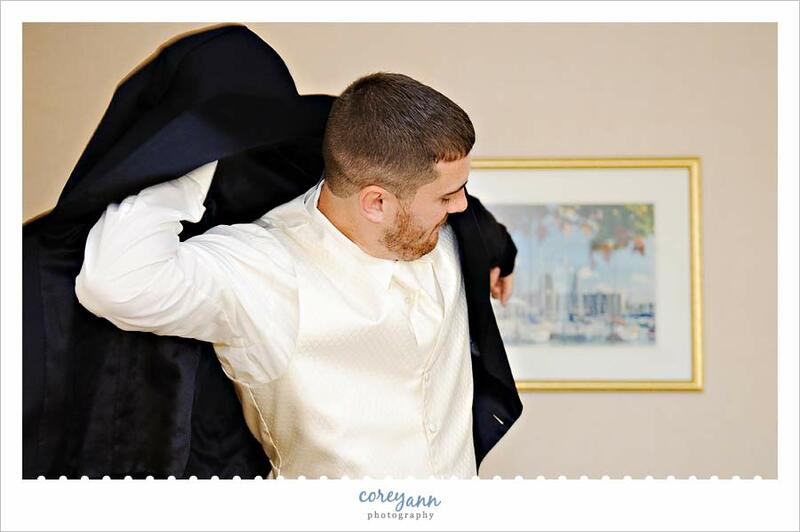 This is a great idea if you want that “gasp!” moment but don’t want to do a first look with your groom. I’ve also seen this done with parents as well. Can you see the bride and her Dad? Nicole captured this image of Amanda walking toward Matt. Can you find me? A long standing joke/thing with this family was that in the 8 years that these two had been together, Matt and Amanda’s Dad had never hugged. One of the things I was on a mission for that day was to capture the moment they finally hugged. Mission accomplished! It’s interesting to see what gets a lot of comments on Facebook vs what you THINK will get a lot of comments. This image is one of those that I personally was like, yay, like but just your average shot. Everyone else though seems to disagree! I do love the bubbles in this image though! Amanda had already scoped out Oberlin and one thing that caught her eye were these doors, aren’t they amazing? Seriously. Aren’t they cute? I could have shot them in front of this door all.day.long. This little arch thing I saw and thought it would make for some neat bridal party images. I was right! All day everyone kept commenting on how awesome these bridesmaid dresses were, I have to agree! Nicole played with the guys while I was with the bridesmaids. I loved this shot so much. I loved it so much I brought the girls over to pose with the guys to create one of my favorite bridal party pics I’ve taken! I always love when my couples have thank you signs, this one is adorable! I finally was able to get out on the golf course for some images at Springvale! We started with a group shot of the bridal party on the bridge. I then let the bridal party go and just played with Matt and Amanda in the yummy light with the gorgeous goldenrod meadows. SO pretty! Seriously I love these guys! Nicole was inside while I was outside with the bride and groom and she was capturing images of everyone enjoying their favors – a caricature artist! The guests kept tapping their glasses and Amanda was laughing at her dad and telling him they just kissed! I loved this image from the mother/son dance! In lieu of a dollar dance Matt and Amanda opted to do a Dollar Dash where each of them ran around for the duration of a song and tried to collect the most money. It was SO fun and hilarious. In the end Amanda won and they ended up with well over $500!!! I hope more couples do this in the future, it was far more entertaining – and profitable! – than any dollar dance I’ve ever seen! Thank you both again for hiring me. I had such an awesome day and you and your families were wonderful to work with!